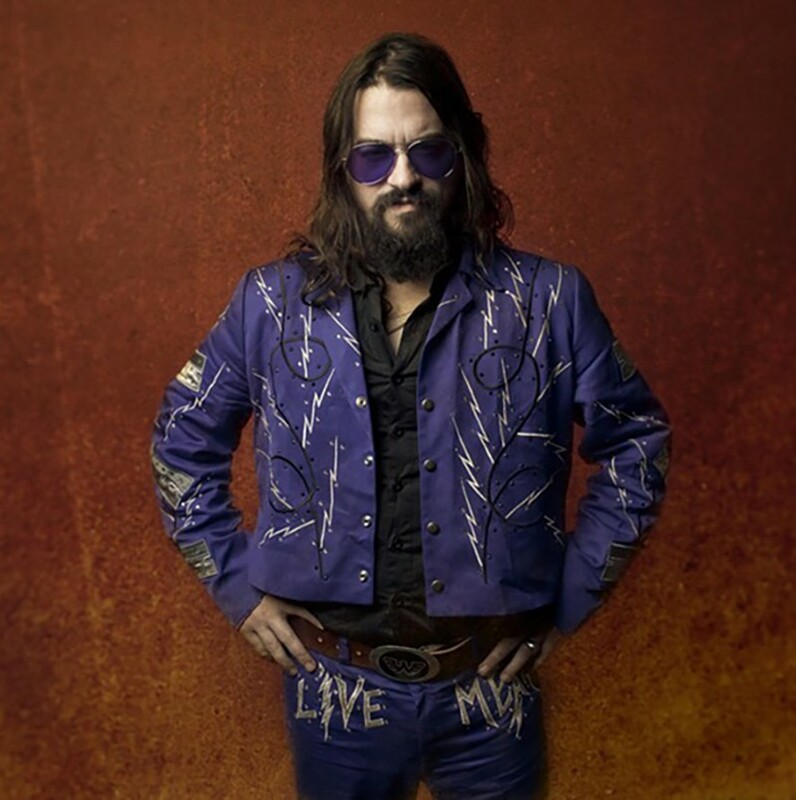 Shooter Jennings Interview: "Marilyn Manson Was My John Lennon Growing Up. I Worshipped His Records." Waylon Albright “Shooter” Jennings is the only son of country legends Waylon Jennings and Jessi Colter. He made his debut with the single “4th of July” off his 2005 album Put the “O” Back in Country, which peaked at No. 22 on the Billboard country charts. Other albums include Electric Rodeo (2006), The Wolf (2007), Black Ribbons (2009), Family Man (2012) and The Other Life (2013). Jennings unveiled his latest album, Countach (for Giorgio), in Richard Garriott’s Shroud of the Avatar role-playing game February 22, 2016. An avid gamer, Countach (for Giorgio) was released on limited edition pink vinyl February 26, and came out on all other formats March 11, 2016. The album is comprised of songs composed or inspired by Academy Award and Grammy Award winning producer Giorgio Moroder, whose credits include multiple disco hits in the 70s and 80s, in addition to songs from Top Gun, Midnight Express and Flashdance. Melissa Parker (Smashing Interviews Magazine): Shooter, it’s great to talk to you! Some critics are calling Countach (for Giorgio) the strangest country album we’ll hear in 2016. Were you worried that your tribute to Giorgio Moroder wouldn’t be received well? Shooter Jennings: I wasn’t worried about it. There were a lot of other people I had to … well, that’s not true. At the inception of the record, clearly we saw some people that did not get it. But we were like, “You’ve got to trust us.” You know what I mean? We ended up putting it out ourselves, and it’s done great for us, so it seems it’s off to a good start. I don’t think that my job is to coddle people or tell them what normal should be to them. I feel like my job is to push it as far as I possibly can and make that normal for people. That’s the continued evolution of music and the point of making it, in my opinion. Some people go into music for other reasons. For me, it’s the creation of something new that nobody’s ever heard before, a new idea that works. I like to be able to take someone away on a voyage and have them forget life for a minute. That’s why I do it, and that’s the fun part of it. I think it has taken me a long time to really get confident enough to go balls out with it, but I feel like this is a step in the right direction. Melissa Parker (Smashing Interviews Magazine): Have you ever spoken to Giorgio Moroder and told him about the tribute album? Shooter Jennings: No, not with him. I had communication with his management at one point where I wanted to play it for him. But we’ve been on tour so much that it’s never worked out where we could be at the same place at the same time. I hope he likes it. I would think he’d like it because there are some things that I did where I took other songs of his and mixed them into certain songs. That’s stuff that maybe nobody but him will catch. That says I did a loving tribute. I think he’ll like it. I hope to meet him one day. It would be awesome to have dinner with him. Shooter Jennings: (laughs) Yes he did. I’ve known him since about 2013. Marilyn Manson was my John Lennon growing up. I worshipped his records. His message was, “You don’t have to be like everybody else. Be yourself.” That resonated with me as a kid. I didn’t feel like I was normal. Manson was just one of the greats of our generation. To become friends with him was just crazy. Of all the people I’ve met in my life that are famous, that dude is my favorite by far because he is genuine. He’s a real person. At the same time, he’s also Dracula, and it’s cool. It’s like he only comes out at night. He’s Marilyn Manson. He’s the inspiration, and I consider him a dear friend. I’ve said, “Hey man, want to come over, drink Coors Light and watch TV?” He’ll be like, “Yep.” He’ll come over, and we’ll hang out and watch movies and play music. The song, “Cat People,” was just an honor in itself for me and an accomplishment for the younger me for sure. At the same time, it was just very surreal. He just killed it vocally. I went to his house at three in the morning with my equipment and recorded it. I only had one set of headphones, so while he was singing his vocals, he had the headphones. I was just sitting there singing “Cat People” with no music (laughs). It was pretty wild. Melissa Parker (Smashing Interviews Magazine): You’re a fan of broadcaster Art Bell, and “Chase” is the main theme of his radio program, so that’s a double tribute because it’s also a Moroder song. Shooter Jennings: Yeah. It’s so funny because it was that song that really kicked my head wide open when I realized Moroder had been responsible for so much stuff I loved my whole life. I never knew it was just one guy. All of a sudden, I’m like, “Holy crap!” The weirdest part is that I didn’t go down the Moroder K-hole until early 2013. A few years earlier, we did a record called Black Ribbons. Stephen King was on it and played a deejay. There’s music that plays behind Stephen King, and that was me kind of ripping off “Chase” in my own way. The sound of that is so mystical. So I was kind of ripping off Giorgio a little bit without even knowing it. That guy is huge for me, and I just went crazy on his catalog. I got one of my other heroes, Richard Garriott, who make these games that I played for years. He’s like a legend of adventure computer games from the 80s on. That dude was in my home everyday for my whole life, so he’s on the record. The whole record is my childhood. Melissa Parker (Smashing Interviews Magazine): Black Ribbons was an experimental concept album; you’ve done psychedelic rock and heavy metal. Does it bother you that you’re still chiefly described as “outlaw country”? Shooter Jennings: Well, yeah, only because it’s usually from someone who’s not familiar with everything. The term, “outlaw country,” annoys me just because it’s silly. I’m fine being called a country artist. But the “outlaw country” thing is usually from someone who’s only heard “4th of July” and has never really cared to do any digging. I read David Lee Roth’s book where he talked about Van Halen not wanting there to be any brown M&Ms backstage in the bowl. He said that they had all this equipment with massive weight, and sometimes buildings were not built to accommodate all that weight. So they put that M&M clause in there to ensure the promoter read every word in the contract. If the bowl wasn’t there backstage or if there were brown M&Ms, that meant the promoter wasn’t paying attention to other important parts of the contract and that there could be big problems on stage that night. When I walk into something and see the “outlaw country” thing, I usually know I’m walking into a place where they have not done their homework, and there’s probably some people that aren’t sure what the hell’s going on. Traveling with Waylor’s Outlaws, my dad’s band, we do Giorgio stuff, songs from Black Ribbons, and they do some Waylon. You can get the whole picture from that show. Melissa Parker (Smashing Interviews Magazine): Maybe the sunglasses add some cred to the “outlaw” thing (laughs). Shooter Jennings: (laughs) But that’s just because I don’t want to have to look at anybody. Melissa Parker (Smashing Interviews Magazine): Well, there will never be another Waylon & Willie. Melissa Parker (Smashing Interviews Magazine): Wasn’t the “outlaw country” basically a product of primarily the 60s and 70s? Shooter Jennings: That’s what I’m saying, too. It was the time. It was a thing. It happened. At one point in time, I was pushing for a genre separation in country. But what I learned from all this is that I think all those genre separations are very bad. A station that plays outlaw country is cool. But if Americana music had not existed, then Jason Isbell would be considered a country artist and country music would sound like that. There are dudes now that are doing such great and progressive things in country and are getting labeled Americana, and country doesn’t have to worry about them. Country can still have this other country pop stuff going on and not have to worry about the progressives because they’re going to end up in Americana. I just think if you got rid of that, there would be a lot of people who would need a home, and that would be country. Melissa Parker (Smashing Interviews Magazine): You collaborated, as a teenager, with your dad on an album. Has it been released? Shooter Jennings: It came out on vinyl. We put it out for Record Store Day 2015 on vinyl. Now it is available digitally. There are no more vinyls left. Back in 2008, I released something called Waylon Forever and did some of the vocal tracks for that with my then current band, the .357’s. But this was the original piece that we released for Record Store Day called Fenixon. Melissa Parker (Smashing Interviews Magazine): Your dad sort of got away from his usual sound to make Fenixon with you. Shooter Jennings: Yeah, he did (laughs). I was making music on my computer and stuff, so I made all those tracks. My idea was to make the music. He wanted me to make the music. The sound going on with us was sort of an industrial rock thing. But dad wrote “I Found the Body.” He was trying to be avant-garde. He did that a couple of times on the record. He was really cool. He was just really enjoying the fact that we were getting to do a record together. When I look back on it, that’s one of my most cherished memories. Melissa Parker (Smashing Interviews Magazine): How did you meet Ron Jeremy? Shooter Jennings: That would be through the great Jon Hensley, my old manager that passed away last year. We worked together for years, he was my partner in Black Rock Country Media, and he was friends with Ron. He was managing Wanda Jackson and asked me to put together a band for her for Jay Leno. I said, “Only if I can play drums.” He said, “Okay.” I put together a band, and we played on Leno. Jon brought Ron Jeremy there, and Ron came to my house afterward and started playing the piano. He’s a great piano player, super classical and super fast. Ron has kind of a shtick that he does, and it was just so funny. We recorded his music on a 7” as one of our first releases. Ron’s just the sweetest guy, man. I love Ron. He’s so funny and sweet and has amazing stories about Axl Rose and all those guys from back in the day. He’s incredibly intelligent and has a master’s degree in special education. Anyway, that’s how we met. Melissa Parker (Smashing Interviews Magazine): Does your mom, Jessi Colter, do any performing these days? Shooter Jennings: Sometimes. She doesn’t like to go on tour with me, so she’s not going to do that. But she does things. We performed at a Kris Kristofferson tribute thing in Nashville at the Bridgestone Arena on March 16. Melissa Parker (Smashing Interviews Magazine): I’ve read that your mom always thought your dad didn’t get the respect he deserved in Nashville. What are your comments on Nashville? Shooter Jennings: I just think it’s all part of the journey. If you’d asked me that at different points of my life, I would’ve had different answers. But Nashville is 100% off my radar anyway. I’ve never lived there during the time I was an artist there, so I wasn’t ever in reach of them. In Nashville, all the people in the music business go to bars together after recording sessions. They couldn’t find me if they tried when I’m recording. I’m so buried in Echo Park. I got hurt by them when I did my experience with a major label there. My experience with that upset me. I wrote “Outlaw You,” and that was the perfect situation where I was off on my own doing my own thing. I was way down the line in New York when I wrote that song about poking fun of mainstream country singers trying to align themselves with the “outlaw” music movement. A friend of mine ran CMT. I loved this guy and would share things with him. He said, “If you make a video of this, we’ll put it on the air tomorrow.” We did and they did, based on his idea for the video and everything. That kicked a lot of fuel in the engine. That was kind of my last interaction. I wrote another song about Nashville, which is a different kind of a statement. It’s more about the new Nashville, not the Music Row Nashville. But either way, I just don’t like it there. I don’t like what it has become. I love Los Angeles, California. I love Hollywood, California. It’s my home. It’s where my children are, where my wife is and where my happiness is. I don’t even think about them at this point during the game, especially when I’m doing a record like this, and we’re doing it ourselves. I have a partner, manager and publicist. We put this new record out there and have gotten really good press. It’s mainly because of how odd it is and about Giorgio and all. I haven’t even thought about Nashville. It’s like I’m not even in the same world as them. That’s probably why I get irritated about that “outlaw country” thing a little bit, too. I’m really in a completely different dimension from Nashville. Going forward in what I’m trying to do really has nothing to do with them. It’s none of their business. Melissa Parker (Smashing Interviews Magazine): What did you learn from your parents about the music business? Shooter Jennings: I learned a lot by the way my dad cared about music. That had a major impact on me. It wasn’t like I thought about it in the end, but it impacted the way I looked at music and how important it was to me. That most definitely was a massive influence. I had a lot of confidence that I could make music. I had a lot of confidence to experiment early on. My dad taught me a lot of knowledge. My mom still tells me there are things they regret. But it’s nothing they could prepare me for. I had to go though it to pay my own dues and to live it. I learned a lot, but there’s no secret. You have to go through all the pain. You have to go through all the heartbreak, and you have to keep going through all of that. You have to keep your eye on the prize. That’s why people like your music, because they’re watching you do that. Melissa Parker (Smashing Interviews Magazine): Didn’t you have plans to do a bio pic on your dad? Shooter Jennings: Yes. We’re still working on it. It has not begun, but there will be something, and it will be really good. Melissa Parker (Smashing Interviews Magazine): Will you appear in the film? Shooter Jennings: No. No. No. Acting is not my thing. As much as I would love to be good at acting, it’s not my thing. For this movie, I really want to be in control of the sound of it, and the stories are very important to me. In my own life, if I had the means to do it, I would probably try writing a movie or really pursuing that. That kind of thing really interests me, the behind-the-scenes thing. I’m a big movie fan, but I just don’t want to act. It’s just not me. I can’t do it. Melissa Parker (Smashing Interviews Magazine): In the Black Ribbons album released six years ago, you don’t paint such a rosy picture of the United States, and you talk about a lack of trust in government. Do you have the same feelings today in the current political atmosphere? Shooter Jennings: Well, I do. I’ve tried to do things to improve it in different ways personally. I’ve learned from it, like that time when I became very shocked by what was really going on and really started digging into different writings. I was in love with this counterculture, which I still live by, but I’ve been living by it for years now, so it’s a little different. I’m watching what’s going on with the presidency. Although someone may not agree with me, I think the best place for this country to be in is if … I’m not going to say which one. There are things that I love about Bernie Sanders, and there are certain things I love about Trump. If they ended up being our two nominees, that would be the closest we’ve ever come to having there be a change. The media is lost with both of those guys, especially with Trump. The media is now proving to have no power, no influence. It all comes from the Internet. In my opinion, a lot of the bad things in the world like violence have come from the Internet because that’s part of it. Right now, corporations have a giant hold on everything, but eventually there’s going to be a time in which the communicating between people is all going to become person to person and decentralized at some point. When that happens, there will be no Twitter and no advertisements on Facebook making money. Each person will make income from their interaction because there will be this web of sharing services, like we’re all connected to this thing. I think eventually they’ll all lose a foothold. I think this election is a great example of how they really can’t keep it down like they used to. They can’t keep all this stuff at bay. The Internet has changed it, and because of that, we’re in a very early stage of a huge evolution where I think we’re going to see the fall of the corporation. That’s why I think, with those two, we’re in good shape. If either one wins, in my opinion, it’s better than any of the other options. If it came down to Bernie and Trump, there are two things that would happen. In debating each other, either Bernie would crush Trump, and it would go to Bernie, or they would be about neck and neck, and it would be close. I think the moment of truth on Trump for everybody will be if someone like Bernie asks the correct questions to poke the holes instead of asking political questions. Same with Trump. My thing with Bernie is the Internet, keeping the encryption alive. That stuff is very important to the health of the Internet. It’ll always eventually go where it’s supposed to go, but it’s a speed bump if those things get tampered with. Melissa Parker (Smashing Interviews Magazine): I’m excited to find out what’s next for you, Shooter. We’re about to start mixing a record on Julie Roberts. She had a song called “Break Down Here,” one of her first hits a few years ago. She came out around the same time as me. Back then I loved her. She was just the sweetest person. Two years ago, my sister Julie was about to pass away, and I went to see her. She played me this song by another artist, and it hit me that Julie Roberts would be right for the song. It has taken us a year so far. God bless her heart for putting up with me and my schedule. But we’re doing it, and it’s awesome. I’m going to let Julie put it out because I believe she deserves to take a shot. So we’re just finishing that. I’m starting one for me. I’m taking a little break to focus on writing for me to put out one record. I know it’ll be the end of 2017 at the earliest when I’ll be done with it, if I started now. Melissa Parker (Smashing Interviews Magazine): Have your kids shown any musical interest? Shooter Jennings: It’s funny because they just take it totally for granted that I do what I do. My son’s starting to like it. But Bama, my daughter, knows a lot of songs of mine. She’s pretty used to it and has been taking piano lessons. She’s great at it. It reminds me a little bit of me when I was her age. She can learn to play songs, but she really doesn’t care that much about it. She’ll move on to the next thing and be great at that. She’s taken some guitar lessons, but if she wants to play something on the piano, she just goes to the piano and plays it. That’s how I was. Bama has really taught herself even though she took basic lessons. She does everything by ear and instinct. I don’t know what direction she’s going to land in, but I think she’ll excel in whatever it is. She excels in everything she does. I just share everything I do with them. They’re aware of what their grandfather did and what their grandmother does. They spend time with my mom. But they kind of couldn’t care less. They like it, but they think there are other things to do. I don’t even really play music around the house, to be honest with you. I listen in the car. My son’s favorite song right now is “The Final Countdown” by Europe because of that Geico commercial. I listen to that five times a day. I have to hear Bama play Thriller a million times and “Cornflake Girl” by Tori Amos a million times. They go through things they like. I just like watching them be happy doing something. © 2016 Smashing Interviews Magazine. All rights reserved. This material may not be published, broadcast, rewritten or redistributed without the express written consent of the publisher.